Every year, TIME magazine showcases the 100 most influential images of the year. According to TIME, these images shape the way we think or directly changed the way we live. Each year ordinary Americans also take photos – millions of them every day. They will never appear in TIME, but these images also shape the way we look at the world and at ourselves. They serve as witnesses to our time, capturing our habits, our interests, and our lifestyle. They reflect what we value: specific people, places, things, and, most especially, moments. Today, we share many of our everyday images on social media with family, friends, and the public. To us, our photos represent a moment in time – one that we will soon move beyond. For future generations, the collection we’re creating will serve as a key to understanding our era. But what came before? What can we learn from photos taken before the digital era? And where can we find these photos taken by amateur photographers in the 1950s through 1980s? Theses are questions we set out to explore. And we’re thrilled to share with you what we’ve uncovered. This article is the first in a series detailing An American Story, our foray into the everyday photos of past decades. We’ll share with you exceptional photos, the collection that emerged, and the themes we uncovered. We’ll dive into questions that arose along the way and technical tips. And, since this is Go Street, we’ll showcase street photography. An American Story is a project we undertook to explore the everyday photos of the 1950s to the 1980s, decades when amateur photography proliferated, but before the digital era enabled rapid and broad exchange of images. Each of you can imagine the photos we’re talking about: negatives, slides, and paper prints, tucked into shoeboxes and photo albums. Some are still cherished, but most are tucked into storage, dusty and forgotten. Many are ending up in the trash as the photographers themselves pass away. These photos didn’t make TIME’s selection, but like our social media collections today, they reveal a lot about life, lifestyles, and historical and sociological evolutions in those decades. The challenge is: unlike our photos today, these physical photos are not easily accessible, so the trends are difficult to spot and messages difficult to glean. That’s what we set out to change. We asked: How could we bring these photos back to life? How could we compile and expose them to the public eye? How could we showcase the “essence” of the images, taken together as witnesses of their era? As we worked through these questions, An American Story was born. Through the project, we aim find, select, digitize, restore, sort, and share photos that describe the lifestyle, experiences, and values of Americans in the early decades of amateur photography, the 1950s to 1980s. In this first article you’ll get a glimpse into the incredible collection we’ve uncovered. We’ve arranged some of our favorite photos into the most common themes we’ve found—themes so familiar, you’ll recognize your own family and photos in them! It will come as no surprise that the most common theme in our collection is group portraits. Often taken in front of cars, homes, and living rooms, these photos tend to be posed. Everyone’s best dress and most proper behavior is on display. There’s hardly a more American pastime than exploring the great outdoors. And, according to our collection, there’s no better way to explore them than by…that’s right, fishing and hunting. Today, fishing and hunting are still the second and third most popular outdoor activities (after camping). In our collection, we found images of both adults and kids—especially men and boys. The classic pose is to proudly hold up the spoils of the day, big or small. Occasionally, we get an “action shot” of fishing. After group portraits, the second most common them in our collection is: cars. No other invention affected American daily life more than the cars. The expansion of the road network created a whole new ecosystem of road-based businesses: gas stations, motels, diners. The popularization of cars and RVs gave new freedom to families to explore their country and discovery new places. The road trip became a vacation destination in its own right. But most of all, Americans loved their cars. And they photographed them from all angles, often in front of their homes and with their loved ones in the frame. America’s vast network of roads has transformed the landscape—and become part of it. Photographers traveling the country in the 1950s and 1980s captured this phenomenon by positioning roads as the focal points of their images. While these photos can be a bit dull, taken together they provide a striking snapshot. One surprising theme that came to light as the project progressed was: road signs. We’ve all seen families crowded around notable signage in tourist destinations, but it is quite stunning how popular these types of photos are—with or without people. These photos seem to be captured primarily for the photographer’s own benefit (perhaps, memory? ), so compositions are typically uninteresting. What is interesting is the number of times certain signs—such as the Continental Divide marker—appear in our collection. The abundance of this landscape photos in our collection was not a surprise—especially since we focused on slides, which are famous for their lending themselves to landscape photography by providing beautiful colors with sharpness and almost no grain. What we found is that landscape photography is…well, challenging…for amateurs. In addition to technical challenges, it’s difficult to create unique, distinctive photos. But fortunately, that hasn’t stopped anyone from trying! 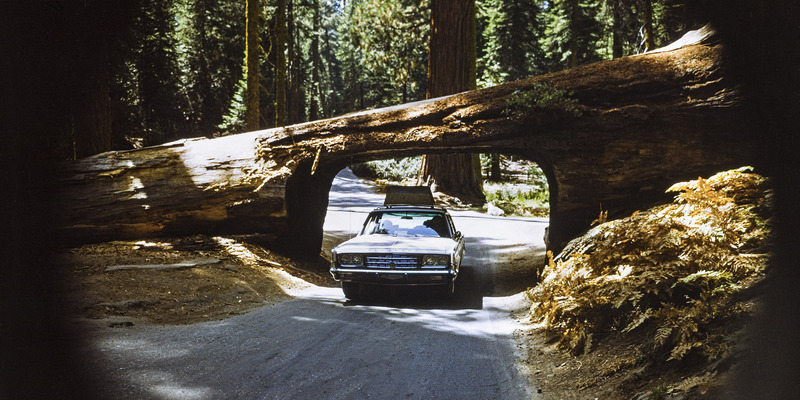 We found thousands and thousands of photos of America’s natural beauty, from everyday scenes to iconic wonders. We’ve featured here a few of our favorites. They combine great composition, light, colors, and technical mastery to provide a beautiful portrait of America’s diverse landscapes. The most popular indoor photos in our collection are of Christmas. And we mean Christmas from all angles: decorating the tree, admiring the tree, piles of presents, properly groomed children, Christmas morning, and Christmas meals. It’s no surprise that Christmas is a theme, since everyday photography is about capturing moments and Christmas is all about special family moments. The expressions and emotions of children discovering and opening their gifts are a particularly good subject. Parades are a quirky, iconic centerpiece of American community life. We often associate them with major cities—like New York or Chicago—and major holidays—like Thanksgiving or the Fourth of July, but in our collection it’s clear: parades come in all shapes and sizes. In the 1950s-1980s they were a staple of small-town American life, and amateur photographers loved capturing their favorite floats and moments. No collection would be complete without photos of furry friends! Clearly, cats are essential. And while we’re at it, why not add some dogs. And…let’s not forget the bears! If our collection is any indication, Americans are almost as proud of their homes as they are of their cars. Interiors, exteriors, prized possessions…all have been diligently documented by amateur photographers. We’ll resist the urge to critique their home decorating skills! This theme blends into other themes a bit. Winter is not necessarily a subject on its own, but snow sure does highlight a car or home or landscape in a special way! In our collections, snow-blanketed cars and homes are especially common. Okay, okay…we know that selfies are a disaster of the smartphone era, but…the concept taking a self-portrait is not new. Back in the day, most people used a tripod or put the camera on something and used the self-timer. And, of course, mirrors came in handy too! In our collection, many of our selfie-precursors seem to have also snuck in a photographer to assist. But you can see a common thread with our modern obsession: creativity. Since Go Street Photo is all about exploring the world of the street with a camera, you may be wondering: where’s the street photography? Never fear: we didn’t forget. Slide photography was never the preferred type of film for street photography due because the film was only available in lower speeds—and expensive. That said, slides were an exceptionally popular medium for capturing touristic and travel memories. That way, the photographer could come home and treat family and friends to a show! We call these photos the gold mine. In most cases, these photos were taken thoughtfully and well, capturing some of the world’s most precious monuments and moments in high quality. First, and the most common, are photos taken by amateur photographers documenting their trips abroad. Europe – especially Paris – feature prominently. While not street photography in the vein of a Doisneau or Cartier Bresson, they do offer a window into life in these locales at the time. Second, there are photos of people documenting a specific neighborhood (perhaps their own?) and the people in it. Some are captivating…though we haven’t found the next Vivian Meyer yet! Finally—and most interesting to us—are photos taken by American military personnel stationed abroad. These are quite rare, but they are fascinating. Very often these photos include valuable detailed notes written on the slides’ borders. We found a few that are genuinely historic—such a serious capturing North Korea in the 1950s and another capturing a NASA mission in the mid-1960s. More to come in future articles! Look for additional articles that take a behind-the-scenes look at the project and profile some of our favorite photographers and collection themes. In the meantime, follow us on Instagram @AnAmericanStory to check out our favorite slides. We post new ones all the time! this is amazing .. so absolutely amazing. Currently scanning 3000+ slides from my parents and allthough a lot are crap – so many great shots from the 80s and early 90s… definitely a time machine. And this is a complete whole level.